A Pacific Oasis crew member out of Oregon removes brush for wildfire suppression repair in the Missouri Heights neighborhood on July 12. 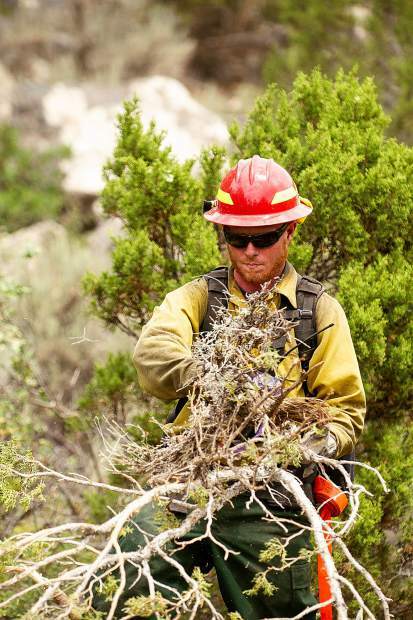 With little rain in the forecast and extra-dry conditions in the backcountry, officials will decide this morning whether to again implement fire restrictions for the Upper Roaring Fork Valley. Upper valley officials will participate in a conference call this morning to determine if Stage 1 fire restrictions will be reimposed, according to Thompson and Aspen Fire Chief Rick Balentine. Garfield County announced Thursday it will reinstate Stage 1 fire restrictions at 12:01 a.m. today, officials said in a statement. The officials in the upper valley wanted to see how much rain fell Wednesday and Thursday before making a decision on the restrictions, Thompson said. According to the National Weather Service’s station at the Aspen airport, two-tenths of an inch of rain was recorded Wednesday and none Thursday. Scott Stearns, a forecaster with the NWS in Grand Junction, said after Thursday the precipitation will clear out for the next week or so. The week after that has a better-than-average chance for above-normal precipitation, he said. However, the next two weeks after that, according to the Weather Service’s long-range forecasting Climate Prediction Center, will bring “a pretty decent chance for below-normal precipitation,” Stearns said. Thompson said he was aware of that forecast, which will probably bolster plans to impose the fire restrictions. Also factoring in to officials’ decision is the presence of hunters in the backcountry, said Thompson and Balentine. Stage 1 restrictions ban fireworks, as well as campfires in dispersed camping areas. Fires are allowed in permanent fire pits or fire grates within developed recreation sites, and charcoal grills are allowed. Another likely casualty of the dry conditions is the issuance of open-burn permits, Thompson said. Oct. 1 marks the beginning of the normal season for open burning in the upper valley, he said. However, the conditions this year likely will mean a truncated burn season at best, he said. Thompson said he looks at the fall as the valley’s “second fire season,” which in the past has yielded fires at Ruedi Reservoir, the Snowmass Creek area and other upper valley locations. “We’re really stressing that the public be very careful,” Thompson said. Stage 2 fire restrictions — which ban all outdoor wood and charcoal fires as well as outdoor smoking — were in effect for the Roaring Fork Valley for much of summer because of dry conditions and the Lake Christine Fire. The restrictions were downgraded to Stage 1 at the end of August, while all fire restrictions were eliminated earlier this month. Despite the dry forecast for the fall, Stearns said the Climate Prediction Center continues to predict a good chance for El Nino conditions for this winter. The weather phenomenon, based on water temperatures in the Pacific Ocean, generally means more snow for southerly areas of the United States. “We will be more than likely transitioning to El Nino over the winter months,” Stearns said.